Westport Dallas is filling stockings for less fortunate children this holiday season by working with our vehicle “Stocking Program” business and community partners to collect new, unwrapped toys December 1st through 12th for the Dallas Forth Worth Toys for Tots program. Westport and local Dallas partners – All Size Supply Co., Stealth Industry, General Truck Body Manufacturing Company, and Pro Staff Administrative & Light Industrial Staffing – are collecting toys for the program. We’re challenging other partners, suppliers and natural gas industry groups to make this holiday season a happier time for their communities. Please help Toys for Tots to bring toys to less fortunate kids by holding a toy drive at your location, or by donating a new, unwrapped toy at Westport Dallas, one of our partner locations, or any Toys for Tots drop box location. Westport is also providing volunteer drivers and its Westport WiNG™ Power System-equipped natural gas Ford trucks to collect the boxes from partner locations and other Dallas area locations and drop them off at Toys for Tots. If your organization is participating in Toys for Tots this year and you need a donation pick-up, please contact Toys for Tots to ensure that all the wonderful gifts make their way to happy children this holiday season. The Westport Stocking Program kicks off in early 2015, when participating dealerships in Oklahoma, Texas, Alabama, Tennessee, Pennsylvania, Kentucky and Florida will be stocking a wide range of bi-fuel and dedicated compressed natural gas (CNG) Westport WiNG™ Power System vehicles including the Ford F-150, F-250, and the F-59. Customer wait times will be dramatically reduced to as little as a few days! 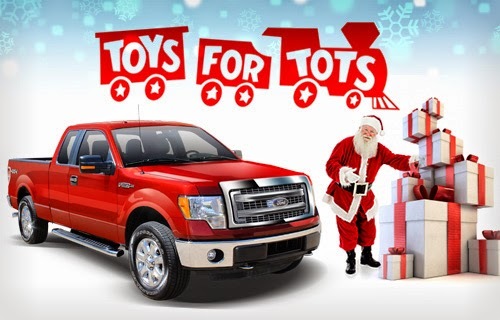 For more information about Westport and its partners in this campaign, visit http://www.westport.com/products/automotive/wingpowersystem/toys-for-tots. Follow Westport’s 12 Days of Toys on Twitter @WestportDotCom. For media inquiries contact: media@westport.com.